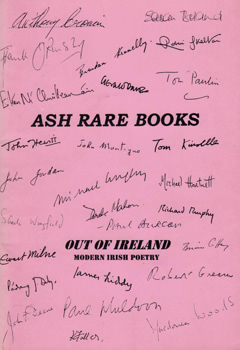 ASH RARE BOOKS : OUT OF IRELAND : MODERN IRISH POETRY. 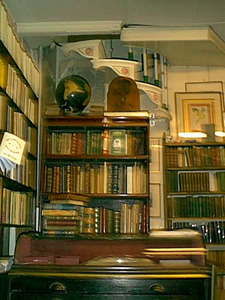 London : Ash Rare Books, . A priced bookseller’s catalogue of 908 items by twentieth-century Irish poets – many of great rarity – and many signed and inscribed. The upper wrapper reproduces many of the signatures. Foolscap 4to (22cm). pp. Original stapled wrappers; very good. 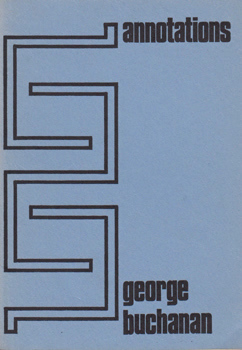 BUCHANAN, George (George Henry Perrott), 1904-1989 : ANNOTATIONS. Oxford : Carcanet Press, (1970). First edition : limited to 600 copies. Four poems from the Antrim-born poet. Crown 8vo (18cm). 36pp. Original pale blue wrappers, lettered and decorated in a John Franklin design in black; faintly bruised, spine a touch sunned, but otherwise very good. Newcastle upon Tyne : Jackson’s Arm, (1985). First edition. 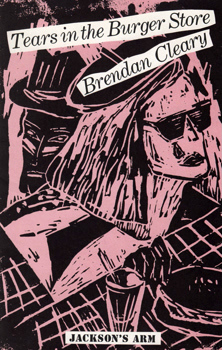 Signed by Brendan Cleary on the title-page. The Antrim-born poet’s first collection – fourteen poems, including “Buying an Orange”, “Abattoir”, “Truant”, etc. Post 8vo (22cm). pp. Original stapled wrappers – a design in pale lilac, black and white; very good. 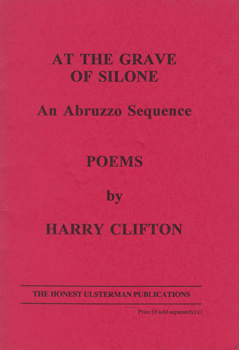 CLIFTON, Harry, 1952- : AT THE GRAVE OF SILONE : AN ABRUZZO SEQUENCE. Belfast : Honest Ulsterman Publications, (1993). First edition. Ten poems from the Dublin-born poet, including “Meltwater”, “In Earthquake Country”, “Firefly”, etc. Foolscap 4to (20cm). [iv],(20)pp. Original cerise stapled wrappers, printed in black; slightly sunned, but a very good copy. 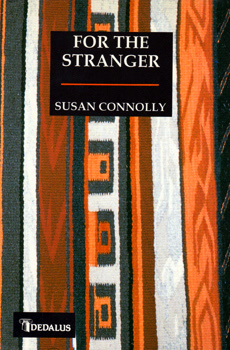 CONNOLLY, Susan, 1956- : FOR THE STRANGER. Dublin : Dedalus Press, (1993). 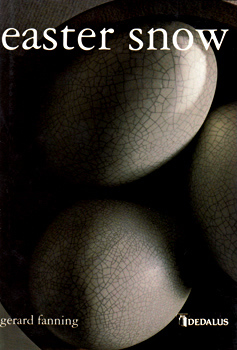 First edition : the hardback issue. The Drogheda-born poet with her first collection – thirty-eight poems, including “Schoolfriends”, “Heartwood”, “The Banshee”, “Moon-Splinters”, etc. Demy 8vo (22cm). (72)pp. Original maroon rexine, lettered in gilt; spine bumped; faint tanning to outer edges, but otherwise very good in in the original Monica Bates dust-jacket. 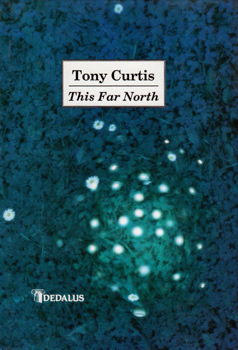 CURTIS, Tony, 1955- : THIS FAR NORTH. 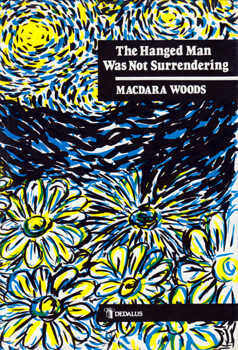 Dublin : Dedalus Press, (1994). First edition : the hardback issue. A collection thirty-one poems, including “Naked Girl with Egg”, “Island Man in Paris”, “Dancing from Antrim”, “From a Famine Journal”, etc. Foolscap 4to (22cm). (74),[vi]pp. Original blue rexine, lettered in gilt; lightly bruised; top edge slightly spotted; text just faintly tanned, but otherwise very good in the original Michael Boran dust-jacket – also very good. 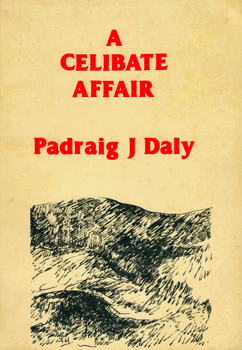 DALY, Pádraig J., 1943- : A CELIBATE AFFAIR. Drogheda : Aquila Ireland, 1984. First edition : the wrappers issue. Thirty-seven poems, including “Cathars”, “Sub Specie Aeternitatis”, “Elegy at Mornington”, etc. Foolscap 4to (21cm). 58,[ii]pp. Original cream wrappers, printed in red and black; lightly used and slightly marked, but a good and sound copy. FALLON, Peter, 1951- & MAHON, Derek, 1941- – editors : THE PENGUIN BOOK OF CONTEMPORARY IRISH POETRY. London : Penguin Books, (1990). First edition. An impressive anthology – this copy signed by two of the contributors, Brendan Kennelly and Tom Paulin. Other contributors include Eavan Boland, Ciaran Carson, Seamus Deane, Paul Durcan, Michael Hartnett, Seamus Heaney, Thomas Kinsella, Michael Longley, Medbh McGuckian, John Montague, Paul Muldoon, Richard Murphy, Desmond O’Grady – and the editors themselves. Post 8vo (20cm). xxii,462,[xii]pp. Original wrappers; lightly used and slightly spotted, but a good copy. Dublin : Dedalus Press, 1992. First edition : the hardback issue. The Dublin poet’s first collection – thirty-four poems, including “The Road to the Skelligs”, “Geographers”, “Orienteering with Elizabeth”, etc – “some of the finest and most artful poems of his generation, not just here but across the globe” (Gerald Dawe). Foolscap 4to (22cm). (60),[iv]pp. Original maroon rexine, lettered in gilt; top edge faintly spotted, but otherwise very good in the Paul Barrass dust-jacket – also very good. HEANEY, Seamus, 1939-2013 : SELECTED POEMS : 1965-1975. London : Faber & Faber, (1980). First edition : [one of just 500 copies in hardback]. An extensive selection of Heaney’s earlier work, including many of his finest poems. Post 8vo (21cm). 136pp. Original blue boards, lettered down spine in gilt; a very good copy indeed in a price-clipped dust-jacket – also very good indeed. 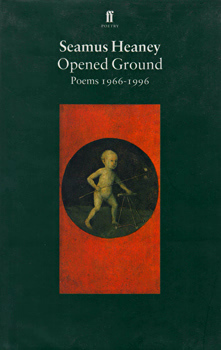 HEANEY, Seamus, 1939-2013 : OPENED GROUND : POEMS 1966-1996. London : Faber & Faber, (1998). First edition. Signed by Seamus Heaney on the title-page. 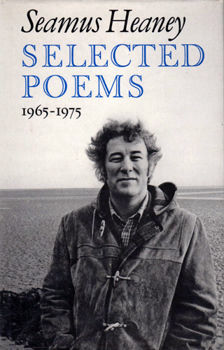 A very extensive selection of Heaney’s work, “as close to being a ‘Collected Poems’ as the author cares to make it”, also including a few poems not previously published in earlier collections, some translations, and ‘Crediting Poetry’, his Nobel Prize acceptance speech. Demy 8vo (23cm). ,(xiv),478,[ii]pp. Original green boards, lettered in orange; tiny hint of a bruise at foot, but otherwise a very good copy indeed, in the dust-jacket – also very good indeed. 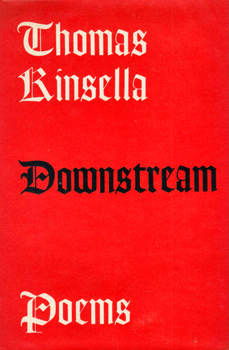 KINSELLA, Thomas, 1928- : DOWNSTREAM. Dublin : Dolmen Press, 1962. First edition. A collection of twenty-five poems. Post 8vo (22cm). (64)pp. Original grey cloth, lettered in black; faint spotting to top edge, but a very good copy in the dust-jacket – just lightly used, but also very good. 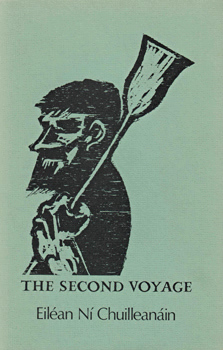 NÍ CHUILLEANÁIN, Eiléan, 1942- : THE SECOND VOYAGE. Dublin : Gallery Press / Newcastle upon Tyne : Bloodaxe Books, (1986). First edition : the hardback issue. A selection of forty-two poems from her earlier volumes, including “The Absent Girl”, “Survivors”, “Going Back to Oxford”, “At the Back Door of the Union”, etc. Demy 8vo (23cm). 68,[iv]pp. Original black cloth, lettered in gilt; very good indeed in the Michael Kane dust-jacket – just faintly sunned, but also very good. 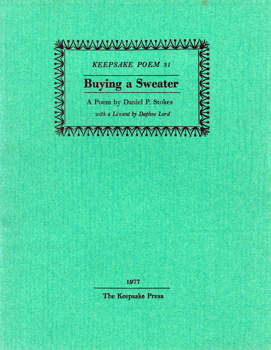 STOKES, Daniel P. : BUYING A SWEATER. Richmond : Keepsake Press, 1977. First edition : one of 168 ordinary copies (of 180). A poem, with a colour-printed linocut by Daphne Lord. Keepsake Poem No. 31. Crown 4to (24cm). pp. Original bright green wrappers, lettered and decorated in black; a couple of tiny spots, but overall a very good copy, with the original Keepsake Press envelope. 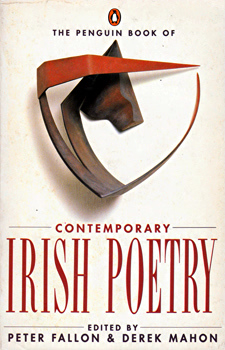 Dublin : Dedalus Press, (1990). First edition : the hardback issue. A collection of twenty-six poems, including “Long Day Short Night She Dances”, “The Country of Blood-Red Flowers”, “Time and the Ice-Fish”, etc. Foolscap 4to (22cm). 80,[iv]pp. Original blue rexine, lettered in gilt; mild spotting of top edge, but a very good copy in the original Graphiconies dust-jacket – a striking floral design in yellow, blue and black on white – also very good. YEATS, W.B. (William Butler), 1865-1939 : POEMS, 1899-1905. London : A. H. Bullen / Dublin : Maunsel & Co., 1906. First edition. “I walked among the seven woods of Coole ...” – heavily revised versions of three verse plays (“The Shadowy Waters”, “On Baile’s Strand” and “The King’s Threshold”), together with fifteen poems (some previously published in a limited edition), including “In the Seven Woods”, “Never Give all the Heart”, “The Withering of the Boughs” and “Under the Moon”. Yeats’ preface provides a highly interesting commentary on his work at this period. Crown 8vo (20cm). xvi,(280)pp. Original decorative blue cloth gilt in a design by Althea Gyles; just lightly worn at extremities; a few slight marks to covers; some spotting, mainly to endpapers and edges, but still an attractive copy. Contemporary ownership inscription of a member of the Dyfnallt family of Breconshire. Return to Modern Poetry index page.